Do you love Chinese food but are looking for a healthier option? I often include cauliflower rice as a detox recipe in one of my seasonal detox programs but decided recently to make the dish a little extra special by adding lots of extra ingredients and making it a healthier version of Chinese fried rice. This is a low-carb dish and is much more nutritious than fried white rice. It becomes a full meal and you can be as creative as you want by adding in different vegetables that you find in your fridge! Other vegetables that would taste delicious: scallions, kale, mushrooms, red or green peppers. Prepare your cauliflower by cutting it up into small florets and one small batch at a time, blending it in a food processor until it resembles rice. You may have to stop in the middle of blending and stir it a bit in order to release any florets that become stuck in the food processor. 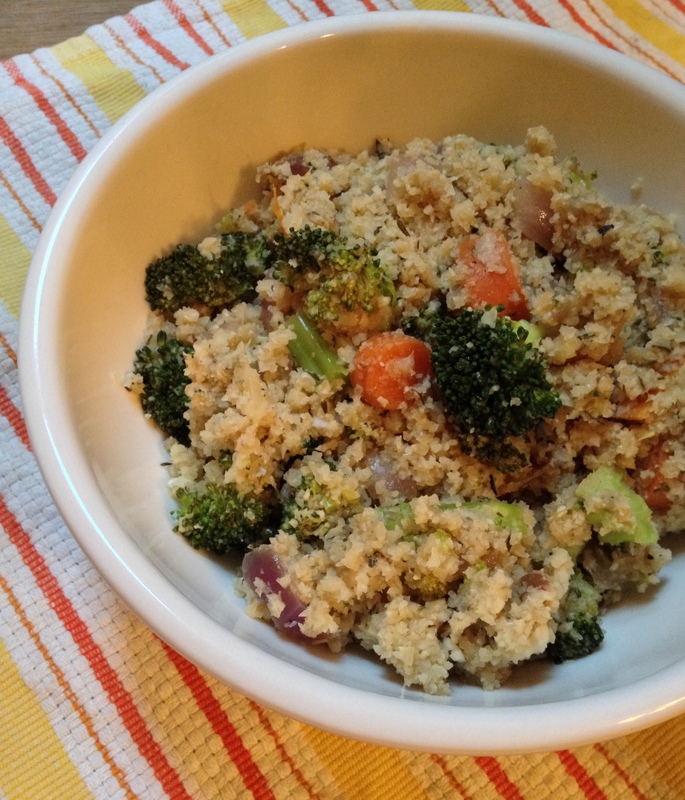 In a large frying pan or skillet, heat 1 tablespoon of olive oil then add the shallots or onion, carrots and broccoli. Cook on low heat for 2-3 minutes until the onions are translucent. Add in all of the cauliflower rice. Mix everything together and add a few splashes of water so that the rice doesn’t burn or stick on the pan. At this point, I like to cover the pan so it steams. Let it cook for a further 8-10 minutes or until the vegetables are tender. Break an egg into the pan and stir quickly until it is cooked. Serve the rice with sea salt, black pepper and soy sauce to taste.